At 19,340 feet, Mount Kilimanjaro is the highest free-standing mountain in the world, and the highest point in Africa. While there are some difficult and technical climbs on the mountain, the vast majority of those who reach Uhuru Peak have hiked there. It is a rigorous, high altitude hike, but requires no previous climbing experience. Over 22,000 people attempt to summit each year. However, people often underestimate the difficulty of this ascent. Altitude sickness or lack of physical fitness can easily cost you the summit. 40% of those who attempt the climb turn back before reaching the summit. On the other hand, with the right preparation, endurance, and perseverance, you have an excellent chance of reaching the “Roof of Africa,” to watch the sun rise over the Tanzanian landscape below. Immunization against yellow fever and cholera are required to get into the country. While there is almost no malaria on the mountain itself, malaria is a huge problem in eastern Africa, so having malaria medication is advised. Also, your DPT (Diptheria-Pertussis-Tetanus) vaccination should be up to date. Check with your doctor. The best months for climbing Mount Kilimanjaro are January to March, June and July, and August to October. These times avoid the monsoon season (April – May ) and the rainy season (November – early December). In general, the weather is very nice on Mount Kilimanjaro, and some people hike during the off seasons to avoid the crowds. The easiest and most direct way from the United States is to fly into Mount Kilimanjaro International Airport. You’ll be able to find one-stop flights, through Amsterdam, that will get you from the USA to Tanzania in about 20 hours. Prices vary greatly, so be sure to shop around. Listed below are examples of good airfare deals, but if you like to spend money, you can easily pay $6,300 for a ticket that will take you to the same place. Once you land, your guide service shuttle will take you on a bumpy 45- to 60-minute ride to your hotel in Moshi. Park regulations forbid hiking or climbing Mt. Kilimanjaro without a licensed guide and porters. However, there are plenty of guide services to choose from, and your guide service will have a great deal to do with the success of your adventure. As always, it’s wise to do your homework, ask plenty of questions, and talk with former clients if at all possible. While it is possible to climb the mountain in 5 or 6 days, taking 7 to 9 days will greatly increase your probability of success. The hike is long and hard, but altitude sickness is the number one reason why people fail to reach the summit. Taking an extra day or two can make all the difference in the world. In general, with guide services, you get what you pay for. At the high end, you’re paying for the reputation of the company: a knowledgeable, trained, and attentive guide, gourmet food (and careful food handling and preparation), a personal porter, top quality tents and equipment, bathroom facilities while camping (optional), safety equipment in case of emergencies (oxygen, hyperbaric bag, etc. ), and claims that close to 100% of their clients make it to the top. But, for many people, this high-roller treatment is uncomfortable and definitely not what they’re looking for in a wilderness experience. Another good bet is a high-end, African-based guide service. These generally offer expertly-trained, English-speaking guides, personal porters, tasty local food – basically, a list of features similar to the American or European services, but not so flashy. If you go with one of these guide companies, you may end up getting a better sense of the culture, lifestyle, and people in this developing nation. Finally, there are the bargain basement guide services. These low-end deals are risky, to say the least. Stories of being abandoned on the mountain or being rushed too high too soon abound. You may find that porters aren’t paid by the company at all and it falls to you to reimburse them. You may find yourself shivering the nights away in a child-sized sleeping bag inside a shabby tent, wondering what it was that you ate last night and why you don’t feel so hot this morning. If the deal seems too good to be true, it probably is. 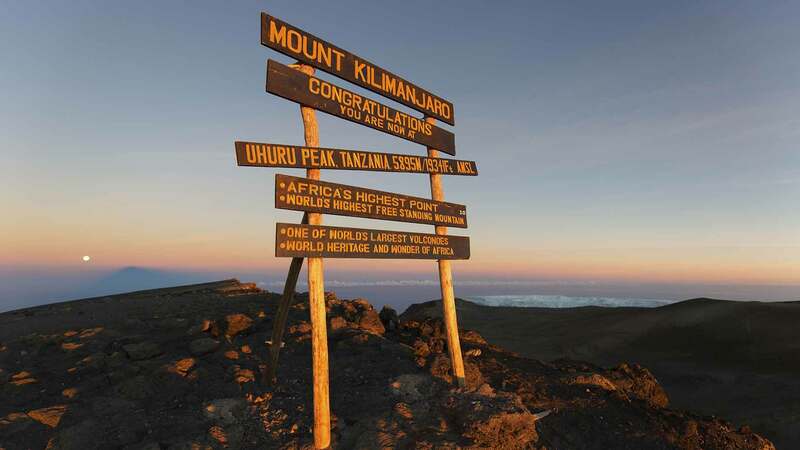 These are just a few of the routes to choose from on Mount Kilimanjaro. Marangu Route – Known as the “Coca Cola Route,” this trail is most popular with tourists. There are sleeping huts (equipped with beds and mattresses) in campsites along the way, and each campsite sells treats like Coca Cola, beer, and chocolate. This route is the least expensive choice, and guide services usually allot 5 to 6 days to complete it. While this is obviously the smart choice economically, some people find this timeframe doesn’t give them enough time to acclimate to the altitude, and they are unable to summit. Machame Route – This route is generally considered the most scenic and beautiful trail up the mountain. It is also a more challenging wilderness experience, with longer hours spent hiking each day. On the plus side, summit day is actually one hour shorter than the Marangu Route. The Machame Route takes 6 to 7 days and gives you more time to get used to the altitude, thereby improving your chances to summit. Lemosho Route – Very remote and therefore less popular, the first day of this hike winds through forest filled with big game animals such as elephant and buffalo. The route is long, requires at least 7 days, and is therefore more expensive. Umbwe Route – This route is short, hard, and spectacular. Known for its caves, you’ll actually spend your first night in the Umbwe Cave Camp and visit two more caves the next day. Western Breach Variation of the Umbwe, Lemosho and Machame Routes – This variation involves some scrambling, but allows you the opportunity to spend a night inside the crater, at 18,865 feet. The advantages are that you get to explore the crater and you have a shorter and therefore easier summit day. The disadvantages are that it is a more difficult route, and sleeping at that altitude can be dangerous if you’re not well acclimatized. Also, due to the changing climate, the mountain ice is melting and there is danger of rock fall. Tipping on Mount Kilimanjaro is compulsory. Ask your tour operator for advice, and don’t tip until the hike is over and you and your gear are back where you’re supposed to be.